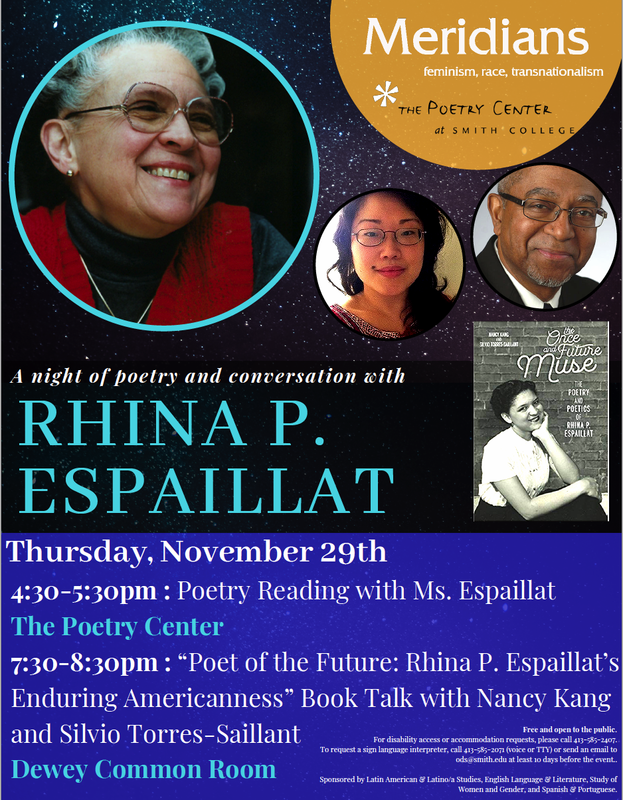 Meridians and the Poetry Center at Smith College invite the local community to a night of poetry and conversation celebrating the life and work of Rhina P. Espaillat. The evening’s events will bring Ms. Espaillat—a bilingual Dominican-American poet and translator who has published eleven collections of poetry—to Smith College along with scholars Nancy Kang, and Silvio A. Torres-Saillant, authors of the recently published book, The Once and Future Muse: The Poetry and Poetics of Rhina P. Espaillat. This event is also co-sponsored by the Latin American & Latino/a Studies, English Language & Literature, Study of Women and Gender, and Spanish & Portuguese departments.